It is the technology that revolutionised Mountain Biking. Soft tail, Dual Suspension, Full Suspension, no matter what name you call it, having a rear shock paired with our front suspension has allowed us to do crazier, funner, gnarlier, better things on bicycles. From simple beginnings, full suspension designs are now vast in their different designs, characteristics, complications and technologies. Some just do the basics, some are downright awful, but when you ride a Full Susser that just works for you, your riding style, your body and your favourite terrain, there is no greater mountain biking bliss. Here we discuss the most popular 4 designs employed today including some examples of modern bikes that use the system, but don’t be fooled, it isn’t that simple, good and bad designs can come from the same system. The placement of the pivots, length of the stays and size of the rockers all greatly influence the overall qualities of the suspension. There are also many other completely different suspension set-ups out there, and hopefully fresh suspension ideas never stop. The simple Single Pivot evolved straight from motocross bikes. The major design element for the pure single pivot (such as the Morewood Zula and Santa Cruz Superlight) is that the rear wheel moves in a circular arc around the point where the main pivot is located. This simple but inefficient system was soon improved as designers began to an extra pivots, rockers and stays to create a linkage that improved the suspension curve, leverage ratio, and efficiency of the suspension. 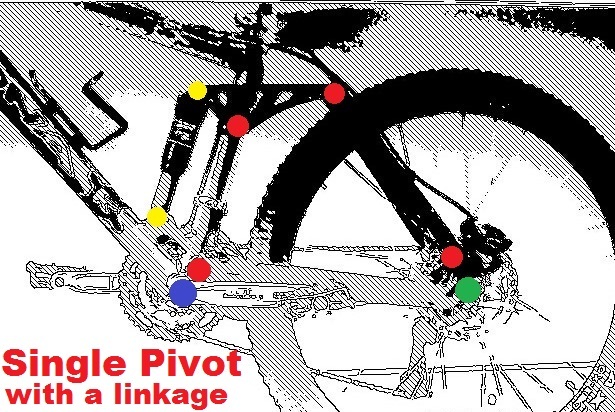 This improved Single Pivot with a linkage, also often referred to as a four-bar linkage, and has transformed the Single Pivot into the most popular and often the best suspension choice. 2014’s bikes that use a Single Pivot with a linkage include the Momson Vipa, most Scotts, most Meridas, all Pygas (with their full floater shock), and most Treks (with their rear split-pivot). 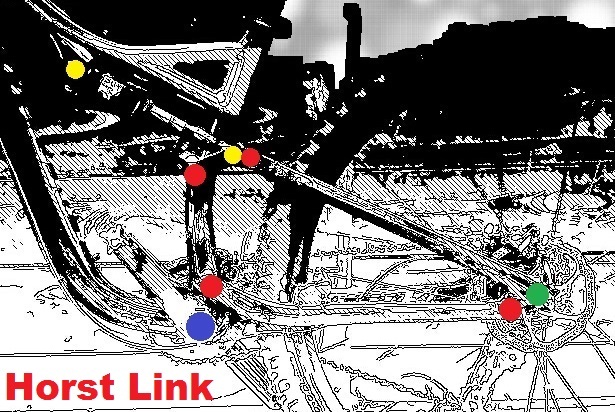 The Horst link has been Specialized’s baby for a quite while with the US patents giving them control for the last 15 years. But that patent is recently up, and now the Horst Link is free to use. The Horst link is also a form of four-bar linkage and from far it looks very much like the Single Pivot with a linkage, but there is one critical difference; the pivot closest to the rear wheel axle is below the axle (on the chainstay) and not above the axle like on a Single Pivot. This means that the wheel first arc’s away from the bottom bracket and then towards the saddle in a slight S-shape. This allows for nice short chainstay’s for snappy handling, and for less feedback through the suspension when braking. All Specialized bicycles (check out the new 2014 Enduro 29er) and Rocky Mountain bicycles (check out the 2014 Thunderbolt 650B) use the Horst Link. 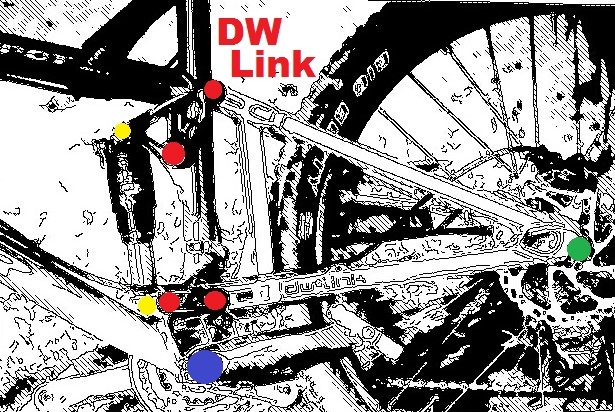 The Dave Weagle (DW) Link, Giant’s Maestro or Niner’s CVA suspension are essentially very similar but their patents (and marketing) will tell you otherwise. Anyway, they are battling this out in court so that we don’t have to. This system is unique in that the whole rear triangle is usually one solid piece. This keeps the rear end stiff and helps with limiting feedback when braking. Notice how there is a small lower link and a large top rocker allowing the wheel to move in a flatter arc. It is a neat system with small linkages and an efficient pedalling platform. However, the BB can be a bit high off the ground or the chainstay is too long affecting the technical handling. Arguably the most beautiful derivation of the DW Link is that of the new Ibis Ripley with their eccentric bearing-in-a-bearing pivot design, and I have heard that they ride as good as they look. 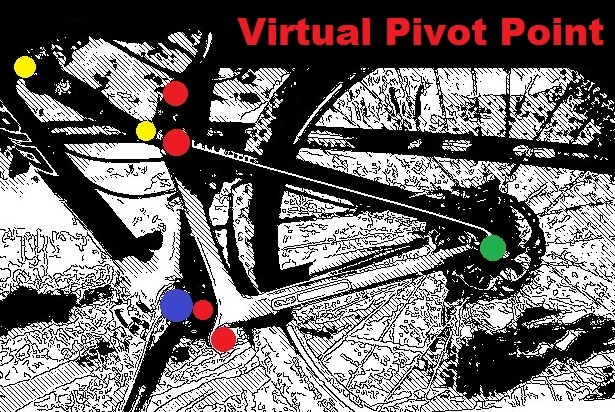 Finally, the Virtual Pivot Point (VPP), is a different take on what we saw in the DW Link. The rear triangle remains one solid stiff piece but with the shock mounted horizontally and the two lower pivots below the BB, the suspension acts very differently. The VPP patent is shared by Santa Cruz and Intense Cycles and is most popular here in South Africa on those expensive custom build Tall Boy 29ers we ogle over every now and then. The VPP is very efficient when you get your shock pressures right and the key to this is getting your sag setting spot on. This is because the suspension curve first gets softer (most other suspension designs get progressively harder right from the start) until it reaches the perfect sag point and then it firms up, resulting in efficient climbing at that inflection point. Other examples of unique designs worth checking out are the carbon sprung systems found on the Felt Edict and Cannondale Scalpel where flex in the carbon frame replaces a pivot or two, or the new Cannondale Trigger with the strange “pull shock”, and the new GT iDrive system which has received improved reviews, or the incredible new Yeti SB95C with the eccentric-cam suspension design called Switch, and of course all the weird-and-wonderful Downhill bike long-travel rear suspension systems. What does this all mean to you? Well, when buying a Full Susser, I often catch my customers saying “I like that bike because it offers great value” or “I plan on spending most of my budget upgrading wheels because they are the most important component” or “whatever happens, it must have Shimano XT” or “I won’t buy the bike if it weighs more than 11kg”. Now I am not saying that Price, Components, Groupset or Weight are not important, but none of them should ever be priority number 1. Undeniably the most important factor when buying a full suspension bike, is that is has a worthy suspension system that suits your riding style and trail preference. An aluminium bike with a fantastic suspension will blow away a carbon bike with a rubbish suspension. It will be easier, faster and more fun to ride. To you and me as the end users, the research and investment that the good bicycle brands put into developing their suspension systems is pricelist. So when buying your next full suspension bicycle be aware of the generic Chinese off-the-shelf rebrands, read the reputable online and magazine reviews, try to demo the bikes you are interested in, and heed the advice of your trusted local bike store.